Self Catering Kitesurfing Holidays|Kitesurf Camp|Kitesurf School & Kitesurf Lessons, Famara, Lanzarote. Lanzarote located just off the west coast of Africa is famed for its pleasant subtropcial climate, seasonal trade winds, crystal clear waters and stark volcanic landscapes. Being only a 4 hour flight from most European cities it’s an ideal place to kick back, relax and learn how to kitesurf or improve your kiteboarding skills. From as early as March to late September the trade winds “Los Alisios” blow from the North East and the groundswells drop off providing a wide variety of kitesurfing conditions ideal for all levels of kitesurfers. For the rest of the year the island still has good wind statistics and there are plenty of freeride and waveriding conditions for more advanced riders. 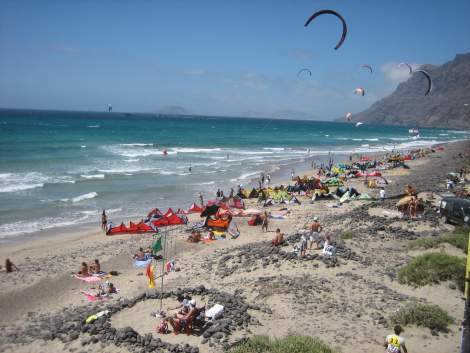 The base for our kitesurf camp and kitesurfing holidays is Famara, home to the Spanish national kitesurfing championships. Everybody is welcome from absolute beginners who have never flown a kite before who want to learn to kitesurf, to Intermediates who have completed a kitesurf course elsewhere and need to improve at one of our kitesurf clinics, to experienced kitesurfers who need some advanced kitesurf coaching or just want to rent accommodation within easy walking distance of the kitesurf beach and spot. Our kitesurf school is the only Canary Sailing Federation in Lanzarote and our coaching program has been developed according to the progression program of RFEV (Spanish Sailing Real Federation) standards and guidelines. Our School got The 2nd Level of Kitesurf instruction at 2012. Our aim is for our students to become safe, responsible and self-sufficient kite surfers. Our lessons provide a proven step-by-step approach to learning kiteboarding in a timely and safe manner. All instructors are qualified via the RFEV system and we offer all levels of kitesurfers. We offer both shared and private kitesurfing accommodation located only meters away from the kitesurf beach and easy walking distance to local amenities. You can decide which accommodation option best suits your needs, taste and budget. Please contact us for more information about the range of accommodation we have available in Famara. If you have a specific requirement then please do not hesitate to contact us and we will endeavour to tailor a kitesurf holiday to suit your needs and budget. To see full details of our kitesurfing holidays including prices, accommodation and course outlines please choose the kitesurf option that best suits your kitesurfing ability from the menu below. If you are not sure or you want help deciding then please do not hesitate to contact the team.